Singapore is a multicultural society, and one of the best things about living here is that we get to celebrate the different festivals like Deepavali, Hari Raya Haji, Christmas, and Chinese New Year. Chinese New Year – the most important of the traditional Chinese holidays – falls on 23 and 24 January 2012. 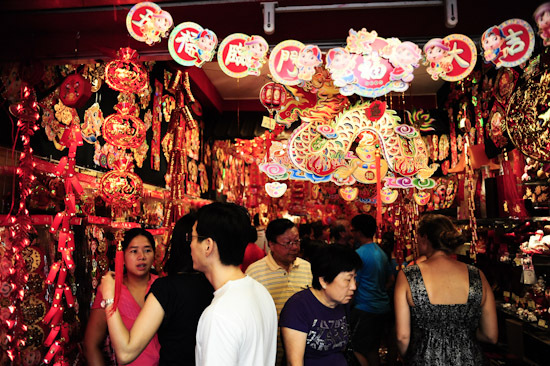 The main highlight of Chinese New Year in Singapore is the Chinatown Celebrations. 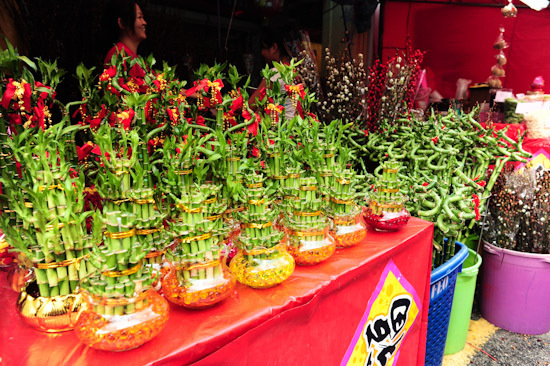 Every year, many stalls will line up the streets of Chinatown, and visitors can soak in the festive mood at the market. Here are some photos that I took at the Chinese New Year Market in Chinatown. I like Chinese New Year. It is the time where we go shopping for decoration items, new clothes and Chinese New Year food. It is the time where families get together for the reunion dinner. And of course, it is the time for us to indulge in Chinese New Year traditional goodies like kueh bangkit, loveletters, pinapple tarts, peanut cookies, and bak kwa. Venue: Pagoda Street, Smith Street, Sago Street, Temple Street, Trengganu Street. These photos make me miss Singapore! I remember visiting the markets at CNY and loving it all. I love Chinese New Year eve the most when I was a kid. My mom would always cook a lot of stuff and it was always a great time! There’s a stall there that’s sells macaroons. Do u know whats the name? do the stalls open in the day too? @june Yes the Chinese New Year “night” market opens in the day too.